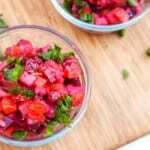 Russian Vinaigrette Salad also known as Vinegret is made with boiled carrots, beets, potatoes and Israeli pickles. Both gluten-free and vegan this salad is crispy and refreshing. Add carrots and potatoes to a small pot (making sure everything is submerged) and bring to a boil. Reduce heat to low and simmer 15-20 minutes until soft when pierced with a fork. Drain and let cool in cold water. In a separate small pot cover the beets with water, bring to a boil, reduce heat and simmer for 40 minutes or until beets are soft when pierced with a fork. Drain and let cool in cold water. Once beets, carrots and potatoes have cooled, peel them and cut each into small cubes. Cut the Israeli pickle into small cubes as well. Mix everything together in a large bowl. Add salt to taste. Serve sprinkled with fresh green onion using olive oil or mayonnaise as a dressing.